The warehouse-scaled galleries at Wasserman Projects are a fitting site for an evolving, and continuously intriguing, dialog about architecture that began with its grand opening show, a glittering event featuring a life-sized, polychromed modular house- a spectacular building within a building. The vast space seems barely enough, however, to contain the work of the three artists in its current, architecturally themed exhibition, “Desire Bouncing.” It’s not so much the work itself that strains the capacity of the space (in fact everything is so gracefully installed and lit that one can fully experience each work on its own) as the raw ideas, romantic (and sometimes sexual) yearnings, and visceral snippets of emotional engagement that come spilling out of the work of these three mature, accomplished artists and ricochet around in the rafters, drawing emotional investment, in turn, back from the viewer. It’s surprising to be confronted with that so immediately in a show that turns on architecture. Make no mistake, this is not some dry, conceptual survey. I need to stick “chthonian” in front of “architecture” to begin to get my head around this work. The centerpiece of “Desire Bouncing” lurks behind a huge theatrical curtain toward the back of the space. Though you can’t see it at first, you hear it everywhere, it’s the heartbeat of the show. That feeling you’re getting that the work here is not quite what it seems, is maybe alive? Yes. The slow beat that affirms it is the soundtrack of Alex Schweder’s sculpture The Sound and the Future. 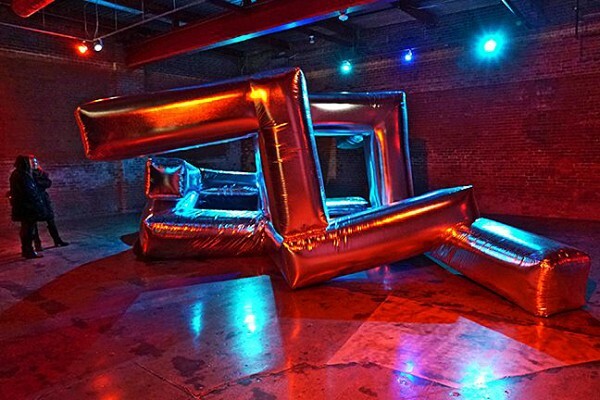 Enclosed in its own cavernous, red-lit space, The Sound and the Future is a massive, inflatable cluster of rectilinear and phallic forms crafted from silver and faux fur fabric that expands and contracts as air is pumped in and out of it. The sound that accompanies it is a track by Underground Resistance, one of Detroit’s and, as Detroit is the birthplace of Techno, the world’s first Techno groups. Reduced to a tenth of its speed, the track sounds like a slumbering dragon’s heartbeat. Stand in front of it and spend a few (or a lot of) moments being hypnotized by the constantly shifting forms that rise and droop in desire and repose, forming vaguely architectural structures as they engorge with air, and then breath-takingly yonic mouths that gape and close as the seductive silver fabric deflates. 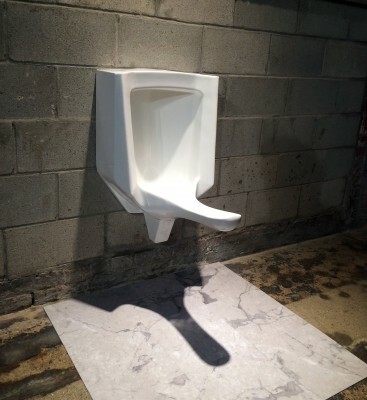 While two other works by Schweder describe, in two and three dimensional mock-up, alternatively designed living spaces that elaborately endeavor to keep their human occupants separate at all times, The Sound and the Future suggests no specific model for living, while emphasizing connection- juxtaposing the swaying stamens of the sculpture, a “women’s urinal,” also installed by Schweder, winks in a dark corner. There is a similar dialog with romance through form, albeit a quieter one, in the work of Alejandro Campins, which come from a series exploring interiors of historic theatres in Detroit. 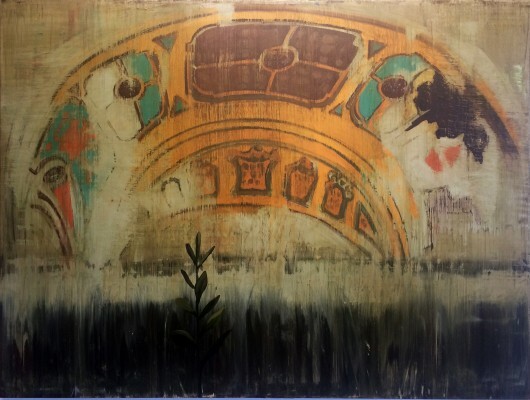 There’s a fine balance of linear and painterly effects in Campins’s big paintings, and he gets the iconic outlines of theatrical architecture just right, combining these solemn interior forms with interesting landscape embellishments, blurring landscape and interior in a now iconic view of Detroit’s half fallen, once grand temples to culture. The paintings seem to have been smoothed over with a squeegee at the finish, both drawing the eye back to dwell on the finesse of his surfaces, and enclosing the works tidily. Where Campins’s works are quiet, somber, and canny, Nancy Mitchnick’s group of paintings and works on paper, which are the first you see as you enter the gallery (and which take a walk-through and return to begin to properly grasp) express the desire of the theme in a very different way. 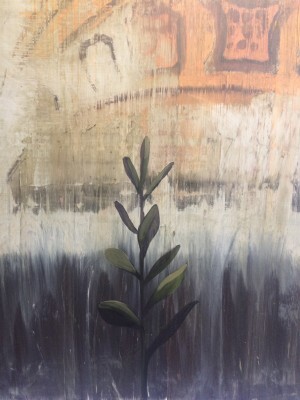 As an artist who lives in Detroit while making paintings about it, Mitchnick naturally has more skin in the game, and this work is raw, unfurling, and pulsating like a wound- or, perhaps, a damp flower unfurling its petals. 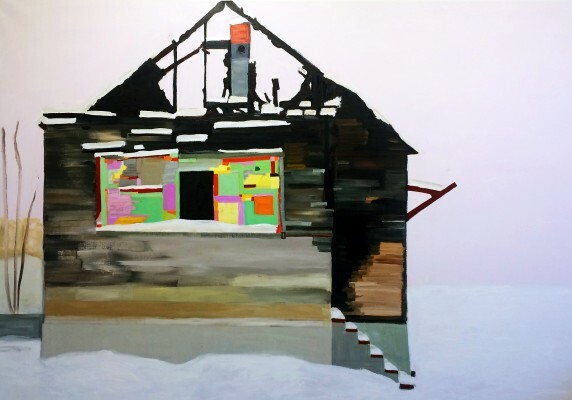 Mitchnick’s works depict structures, abandoned, half fallen, lapsing into neglect, patched over, mantled in snow and drenched in directionless, otherworldly light. Mitchnick builds these skeletal structures- alternating bars of multihued wood and sky- in slabs, scrapes, flourishes and caresses of paint that lay both her innocence and her deep knowledge utterly bare, valuing neither above the other. 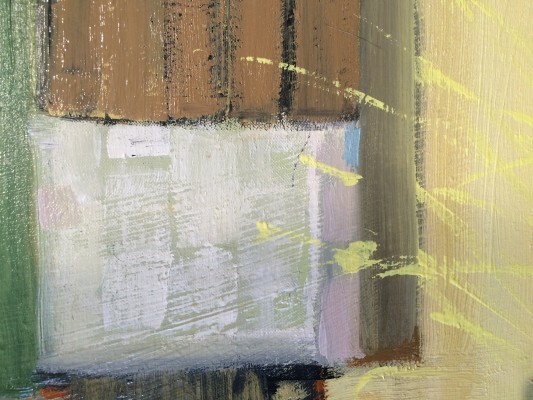 What she is able to channel, through an intuitive understanding of form, color and the nature of paint, is the desperate, howling human element of which these empty structures have become the symbol. This narrative slips the bonds of language and history, running parallel to each while being neither. Bypassing all traditional means of visual storytelling in the landscape genre- objectivity, language, handsome technique- Mitchnick wrings a wildly romantic, purely emotional insight about death and the fecund, unglamorous resurgence that inevitably follows it, as naturally as certain forms and grids, for reasons we cannot put into language, draw on our very souls.